IN July 1966 it was back to work again for those workers at Grundig who were laid off because of the seamen's strike. Pay-offs at the giant Dunmurry plant took place over a three week period and resulted in 350 workers - male and female - losing their jobs. The call for the return to work was made by the employers only hours after the 45 day strike was called off in London. But the firm couldn't be sure of a full turn out. DISTILLERY had got a real result back in July 1977 when their appeal for permission to develop a football stadium at Ballyskeagh was approved. The Planning Appeals Commission stated that the Lagan Valley Regional Park would gain by the tidying up and landscaping "of an area of land at present characterised by its sir of neglect and squalor." In a bulletin of decisions, the Corn-mission said that in allowing the appeal, with conditions, it accepted that the road serving the proposed stadium was far from satisfactory. The Lambeg area choir of the Womens Institute who won the Carrick Trophy as winners of the Intermediate Class C at the Choir Festival in May, 1966. Conductor was Ivor Burns. IN July 1977 Lisburn detectives were continuing investigations into one of the most daring armed robberies in the time for some time. It happened at Lisburn Post Office in Linenhall Street. Three masked and armed men had held up staff at the sorting office beside the general post office and got away with an estimated £12,000. Public appeals were issued to try and catch those responsible for the raid. TRAFFIC congestion was posing major problems in Lisburn in 1971 since the one way system was introduced in parts of the town. In a effort to reduce the flow of traffic through Lisburn, the DoE had developed a throughpass which would enable drivers to avoid the town centre. Although the throughpass was to lighten the flow of traffic considerably, shopkeepers in Seymour Street were virtually cut off from their customers. LISBURN was confirmed as Northern Ireland's second largest municipal borough in July 1971 with a population of 28,904. It was just over 6,000 short of Bangor's 35,105. According to provisional census figures the population of the town had rocketed by 7,382 since 1966. A break down of the figures showed that women were in the majority. There were I14,214 males and 14,690 females. Lisburn's rural district also showed a sharp increase since the last census. There were 71,475 people living in the district compared to 66,686 five years earlier. And once again the men were in the minority. Females totalled 36, 253 against 35,222 males. Third and fourth largest boroughs were the twin towns of Lurgan and Portadown. Lurgan's population stood at 23,853 while Portadown's was 20, 577. The increase in population here was in keeping with the trend throughout Co Antrim. There were now 353,417 people in the county compared with 313,991 in 1966 - an increase of 39,426. The figures showed that Belfast's population had fallen by nearly 40,000 in the same í time to 358,991. The sharp rise in the population of-Lisburn came as no surprise. The Mayor Hugh G Bass said: "The figures are very encouraging and the Borough Council had been working on the assumption that the population would be going up to 40,000. The figures just issued are in line with what we expected but perhaps were slightly a bit faster than expected." 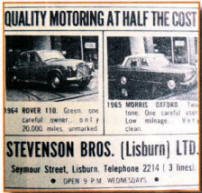 Back in 1966 Stevenson Bros. Lisburn promised quality motoring at half the cost. 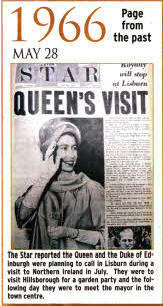 The Star reported the Queen and the Duke of Edinburgh were planning to call in Lisburn during a visit to Northern Ireland in July. They were to visit Hillsborough for a garden party and the following day they were to meet the mayor in the town centre. IN July 19711he Northern Ireland Amenity Council, supported by sponsorship from Coca Cola Ltd., organised an anti-litter week. The Friends' School scout troop decided to do more than just clear up a few streets, they decided to tidy up the weir o the River Lagan at Hilden. The boys set to work with will, and eventually managed to half fill a skip, which was provided by the Council. The youngsters had to deal with a wide range of rubbish ranging from dead cats and pigs to trees and logs weighing up to half a ton. But when they saw the result it was felt it was worth all the hard work. 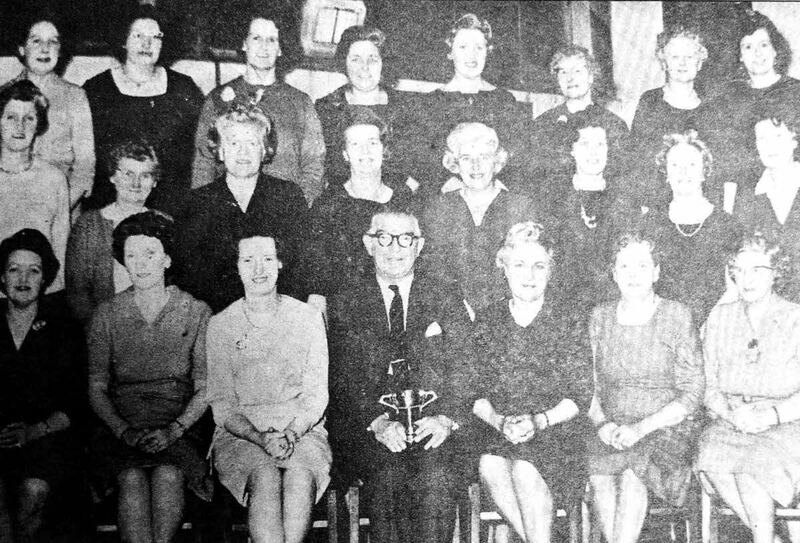 In July 1971 Minister of State, Mr. Don Concannon visited Knockmore Government Training Centre on the Knockmore Road. The Centre, opened in 1960, was the second of I4 in the Province. It had 104 trainees on a series of industrial courses including radio and television repair, capstan lathe operating, general engineering, automatic lathe setting, electrical maintenance and electronics.